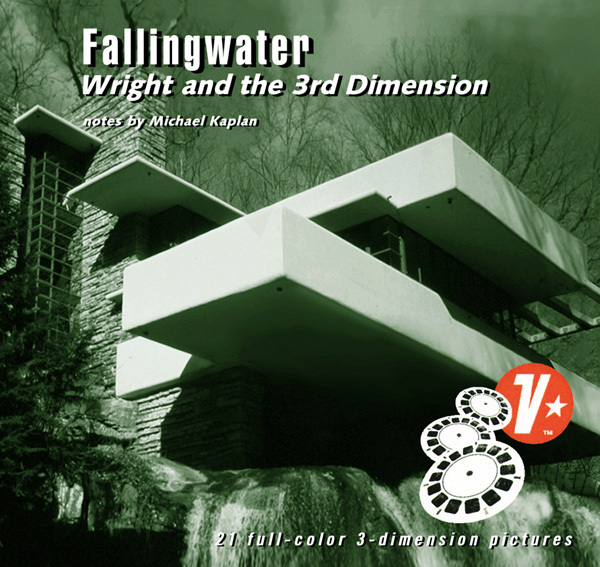 Second in a series documenting great works of architecture using stereoscopic (3-D) photography, "Fallingwater: Wright and the 3rd Dimension" is published by View Productions under the direction of Michael Kaplan. Considered to be Wright's finest house it is possibly the most famous example of domestic architecture in the US. Wright (1867 -1959) built the house in Mill Run Pennsylvania. It was noteworthy that Wright, instead of building the house under the falls, put it on top of the falls allowing it to blend in to the environment. "Fallingwater is a great blessing - one of the great blessings to be experienced here on earth. I think nothing yet ever equaled the coordination, sympathetic expression of the great principle of repose where forest and stream and rock and all the elements of structure are combined so quietly that really you listen not to any noise whatsoever although the music of the stream is there. But you listen to Fallingwater the way you listen to the quiet of the country ...."
Each reel contains interior and exterior views of Wright's house along with some stunning shots from below the falls. Also included is a descriptive jacket which describes the content of the reels. The reels are housed in a plastic box which is similar to a CD box. Wright earlier stated that "the only photograph that can be made of architecture is three-dimensional." The first commercially available stereoscopic photographs of Wright's work, "Fallingwater: Wright and the 3rd Dimension" captures the emotional experience of space, light and materials that characterizes what may be the most extraordinary house of the 20th century. The packet of 21 full-color three-dimension photographs on three View-Master® reels contains interior, exterior and detail views, and notes describing Wright's interest in three-dimensional photography. Michael Kaplan is Professor of Architecture Emeritus at the University of Tennessee, Knoxville, where he has taught architectural design and theory. Winner of the AIA Education Honors Award in 1991, he is a licensed architect and has lectured and published widely on cultural aspects of architecture. He is a veteran stereo photographer; his lecture on the history, theory and practice of 3-dimensional architectural photography has been presented at venues throughout the United States. 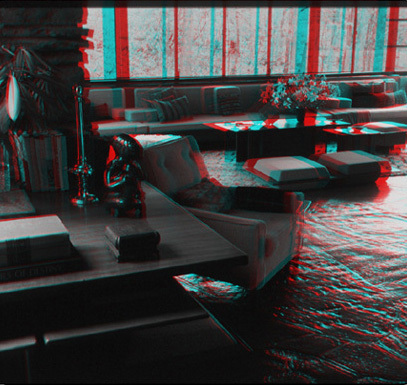 The images below are anaglyphs and require red/blue glasses to view properly. The images on the reels are in color. Also available from the same author the Goff Houses, Frank Gehry Sheet Metal, Eames . 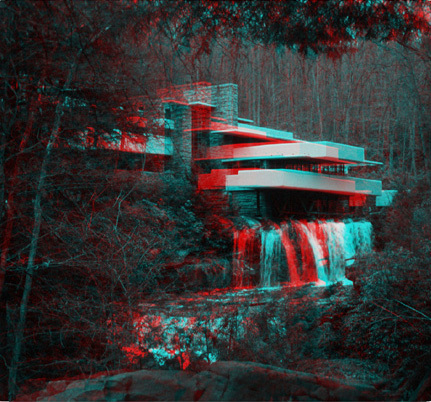 Stereo images ©1998 View*Productions, "Fallingwater" is a registered service mark of the Western Pennsylvania Conservancy. All rights reserved. This Architecture Circle site is owned by Berezin Stereo Photography. Want to join The Architecture Ring? Click here for info.